Literacy is a vitally important tool for kids to succeed, yet many underprivileged children in our area don’t have books on their own. 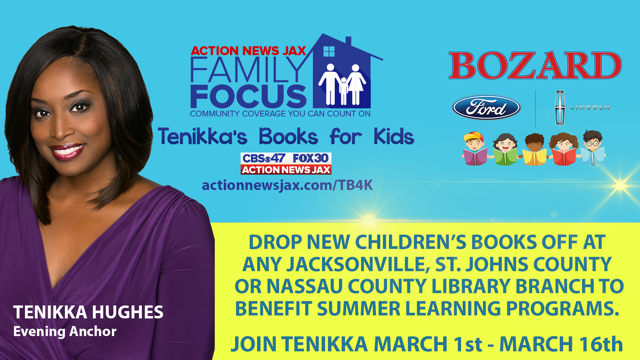 Action News Jax Family Focus, 95.1 WAPE, 96.9 The Eagle, the Jacksonville Public Library and Bozard Ford Lincoln are teaming up to change that. Tenikka’s Books for Kids (#TB4K) is a book drive collecting new children’s books for our libraries summer learning programs. All eligible books will be given out to children enrolled in the programs so that they can have reading materials of their own.